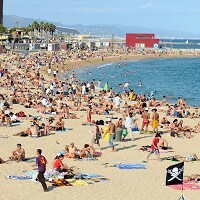 New figures released by the Spanish Tourism Office have shown that more people are holidaying in Spain. The figures showed a 9% year-on-year increase in the number of British travellers who visited the country during the first nine months of 2011 to more than 11 million. The sandy shores, sunshine and delicious food encourage Britons to take flights to Spain. However, before jetting off many are likely to have taken out a comprehensive travel insurance policy first. Package holidays were among the biggest attractions for British tourists when it came to Spain, the figures showed. The proportion of British travellers who headed to Spain on package holidays rose slightly to just over 35%. Figures showed a 42% monthly rise in the number of Britons who visited Spain in April against the corresponding period in 2010. The Balearics saw the highest number of visits by UK travellers.